Maybe you think you have to be a big executive to plan your own career retreat. Maybe you think you have to take a week off, check into a five-star hotel, and sit in silent meditation until your future becomes clear. Ah . . . no. You—yes, you—can plan your own career retreat, even if your local Ritz is out of the question. First, what’s a career retreat? 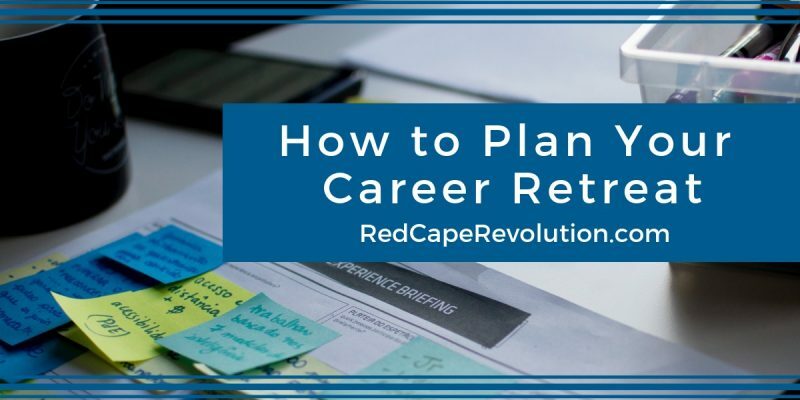 A career retreat is a scheduled block of time when you focus your attention on the person who has the most at stake in your career. The actions you need to take now to get there. It’s a chance to peek inside your career cockpit and make sure that the direction you’re traveling on autopilot is taking you where you want to land the plane. You spend decades of your life working in (and worrying about) your career. Why not commit time and attention to nurturing it? You don’t need to book a fancy guru getaway to have a great, revealing career retreat. Creating and holding your own retreat is significantly better than not having one at all. Start with some simple planning using my ten questions below. If you’d like these questions in a PDF worksheet, download them here (free). 1. The main area of focus (or question I’d like to answer) during my retreat is . . .
What’s most important to you NOW? What are the whispers you’re hearing that need to be addressed? This is the time for the bold truth. 2. When I have the answer to that question (or have clarified my focus), I’ll feel or know . . .
What’s the result you’re looking for? Is it feeling more confident that you’re on the right track–or deciding that you’re not and need to take other actions? 3. For me, the right amount of time I can invest in this retreat without feeling stressed is . . .
Too often, I talk to people who want a career retreat but think they need to plan a long getaway. Then, they realize that the demands of their life just won’t allow it, and so they decide to wait. And their retreat never happens. Choose an amount of time that feels possible to you. Maybe it’s just a Saturday morning, or a weekday evening. It’s better to start small rather than not start at all. 4. For me, the right amount of money I can invest in this retreat without feeling stressed is . . .
Once you know how much time you can invest, what would make your retreat special, more helpful, or more YOU? In most cases, we’ve significantly underinvested in our self care and professional development. No matter whether you use funds on anything from a new notebook, hotel room or nice meal, or even a professional coach to guide you, it’s time to decide that you’re worth it. 5. Based on the time and money I’m willing to invest, here are three possible locations for my retreat. . .
You can’t do future thinking in the same place you do today’s work. You’ve got to change your environment. But that doesn’t mean you have to leave town. Choose your local library, coffee shop, or even a conference room elsewhere in your office building (away from your team). Your goal is a place you’re comfortable and where you can think and write without distractions. Now that you know the question you want to answer or the area you want to focus on, what do you need to bring to your retreat? What’s your pre-work? What do you need to gather in advance so you can reference it during your retreat? At the risk of being old-fashioned, paper is your friend here. Unless you’re super disciplined, once you open up your computer or phone to go look at a statement or file, you run the risk of following the internet rabbit trail and losing your own trail of important thought. Grab a file folder now, and start filling it with anything you think you’ll want to refer to that day. And don’t stress–in reality, you’ll likely need less than you think. 7. The help I need to prepare and commit fully to this retreat is . . .
Who needs to be onboard to make this time work for you? Do you need to ask your spouse to take kid duty and not call or text? Do you need to inform your team, your mom, or your neighbor that you’ll be unavailable? Or, depending on the question you want to answer, do you need a professional such as a coach, financial planner, or legal counsel to give you advice you can process during your retreat? You don’t need to tell anyone why you need their support. Just ask for what you need. 8. My next three actions to get my retreat in place are . . .
What will make this retreat plan REAL? Do you need to mark the day on your calendar? Make a reservation? Ask a friend to ask you about it three days from now? Make these actions as specific as possible. Ideally, they’ll be things you can check off in one action or conversation. Your goal is to remove the obstacles that will get in the way of your chosen retreat time. Take those actions. 9. The date & time of my retreat will be ___________________. 10. I’m excited about this retreat because . . . Finally, why is this important to you? At some point between now and the date of your retreat, something’s going to emerge and tempt you to sacrifice the day and time. You’ll think that the other person/issue/opportunity is more important. Innoculate yourself against that now by knowing, down deep, why commiting to your personal retreat is exciting and important to you. Our free downloadable planner helps you walk through the big decisions. Get your retreat planned, and keep your career growth going all year long! Need help? Schedule your complimentary consultation with me today to talk more about what’s happening in your career and how you can create the retreat that works for you!